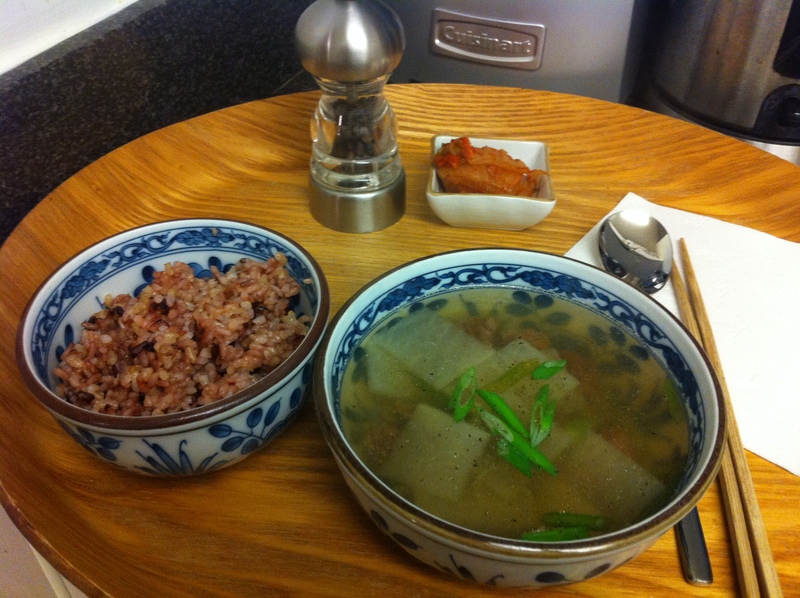 Sogogi-moo-guk (소고기무국) is one of the most basic and simplest Korean soups. 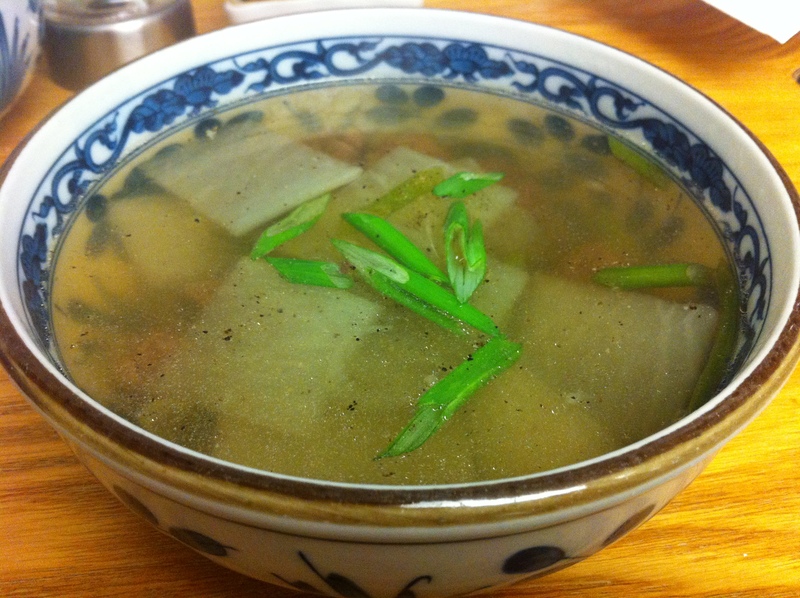 It is also cooked for traditional memorial ceremonies for ancestors called jaesa (제사). 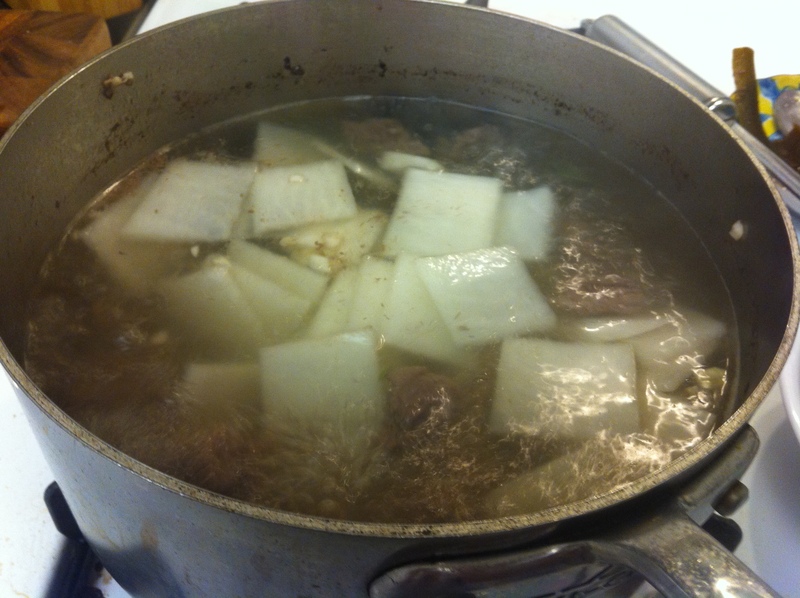 As you will see below, the cooking technique and even many of the ingredients are very similar to miyuk-guk. 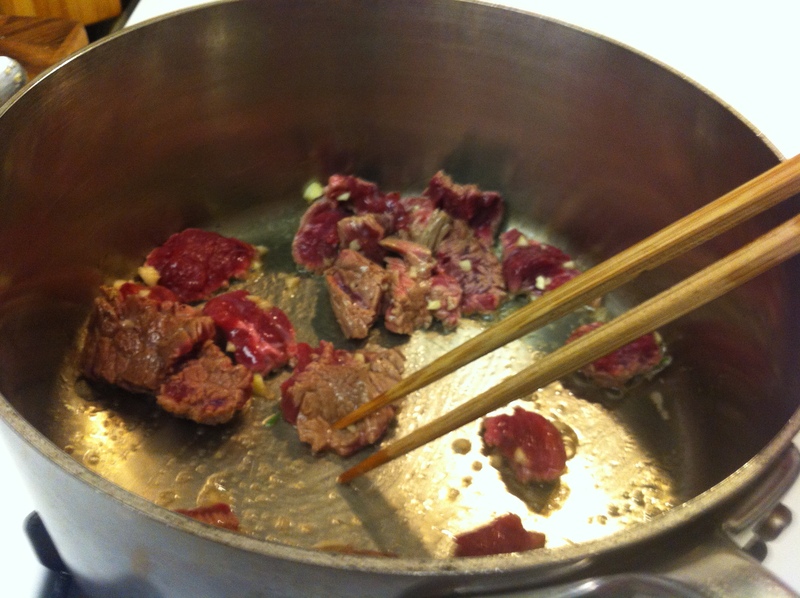 Like miyuk-guk and many other Korean dishes, you are supposed to soak the beef in cold water to draw out any remaining blood in the meat. This is to insure the clarity of the broth. Today, I want to show you what happens if you do not soak it long enough and how to save the dish. I used left over brisket that I had froze a few days ago. I should have soaked the meat longer because I defrosted it in the microwave and the center was still a little frozen when I placed it in cold water. At the end, the soup turned out great, but I thought this might be a great opportunity to show my readers what you can do when this happens to you as well. 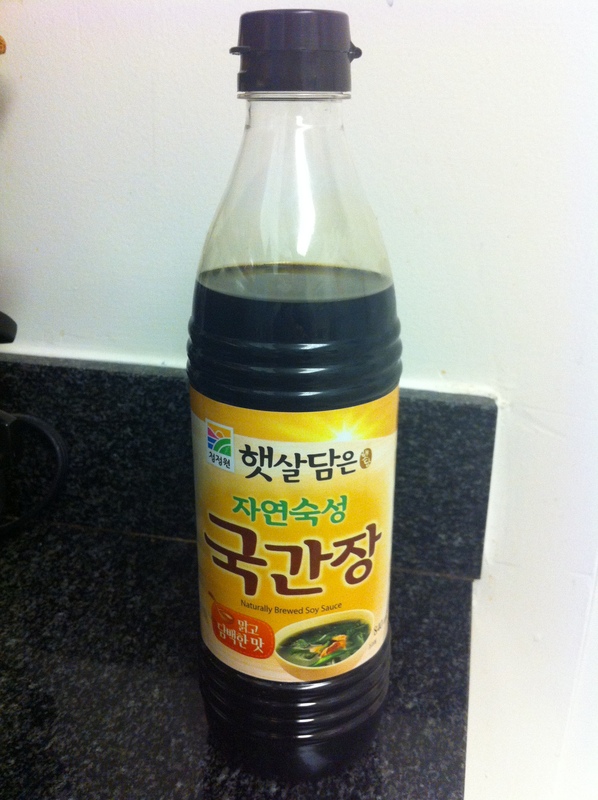 If you do not have gukganjang, which is a Korean soy sauce that is lighter in color and saltier than the common Japanese soy sauce, substitute it with less soy sauce and a little salt. 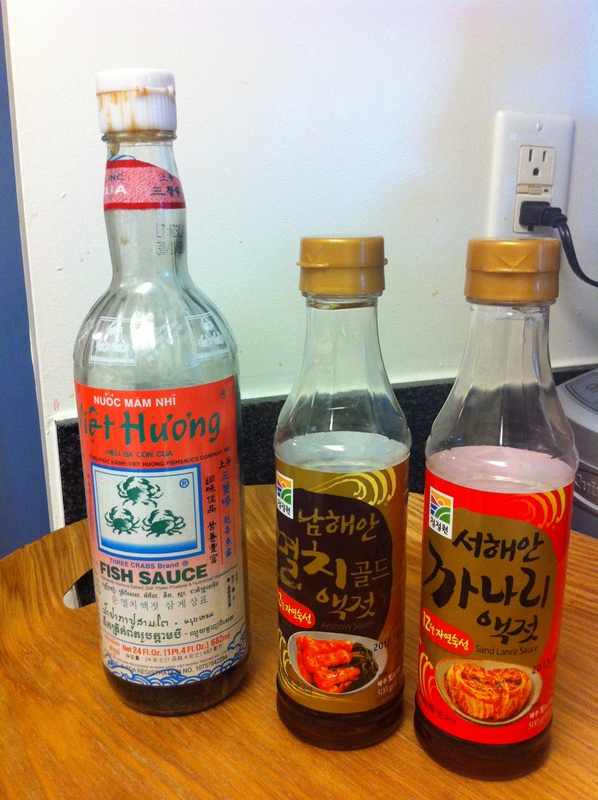 If you are using both gukganjang and fish sauce, I like to add a tablespoon of each to deepen the flavor profile. 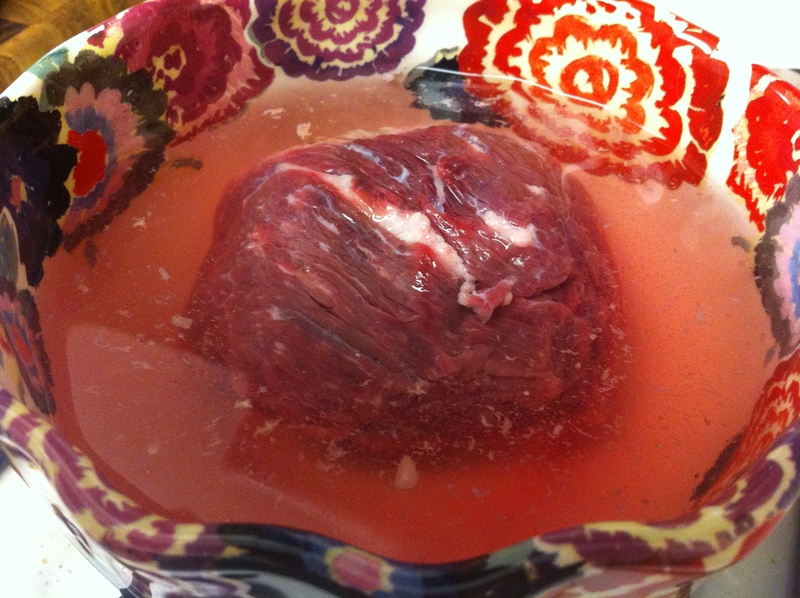 Soak the whole beef into cold water for about 30 minutes. Cut the meat into bite size pieces. 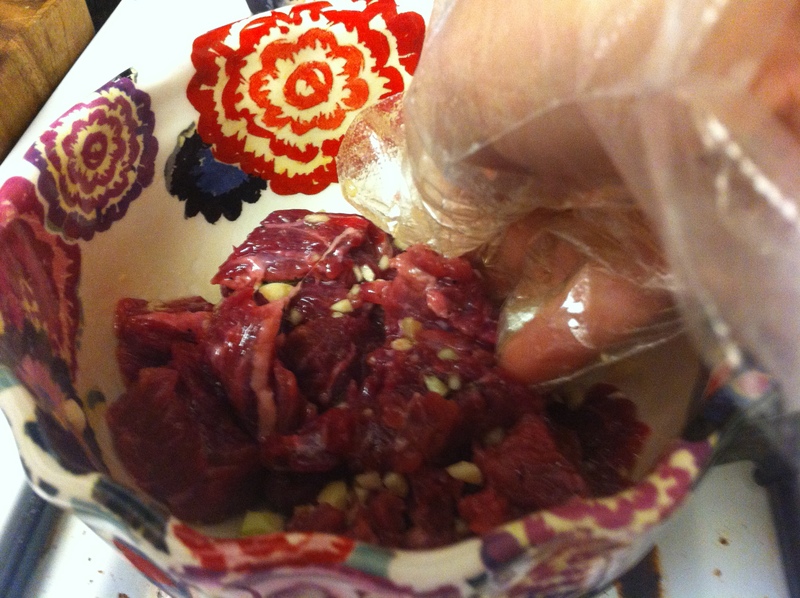 Marinate the beef with 1 tablespoon of sesame oil and soy sauce each, 1 teaspoon of minced garlic and pinch of black pepper. Let it sit for about 10 minutes. In a medium size pot on medium-high heat, drizzle the remaining 1 tablespoon of sesame oil. Sauté the marinated meat for about a minute and add the moo. Sauté for about another 3-4 minutes until the moo is about halfway cooked. 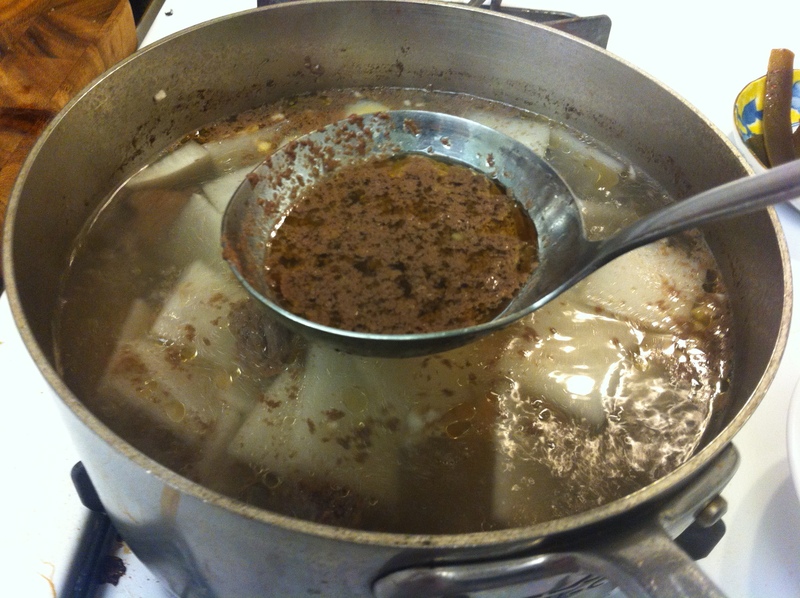 Pour about 6 cups of water and add the dashima and bring up the heat to high. When the water starts boiling, take out the dashima and lower the heat to medium-high and simmer for at least 20 minutes. This is when I started noticing that I didn’t soak the meat long enough in water. 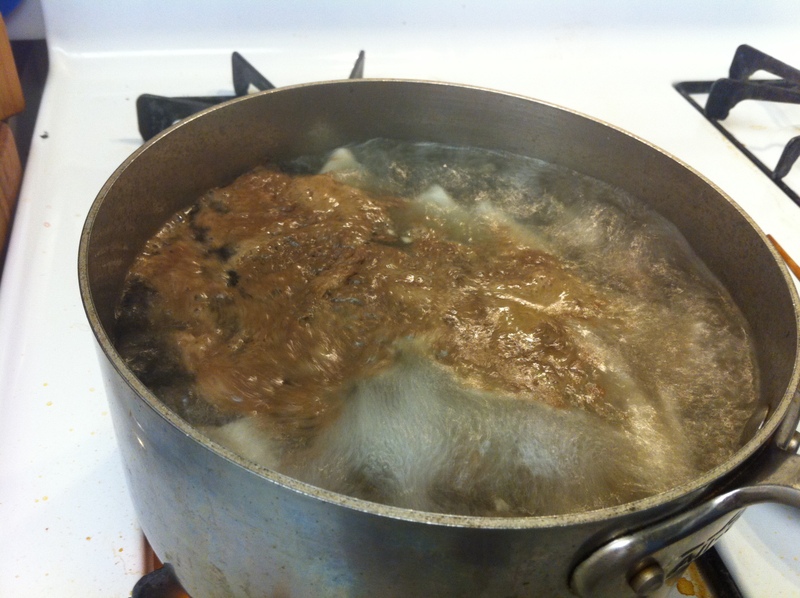 As you can see in the picture, there was a brown foam that started forming on the surface. All I had to do was when the water started boiling I scooped out the foam with a ladle. 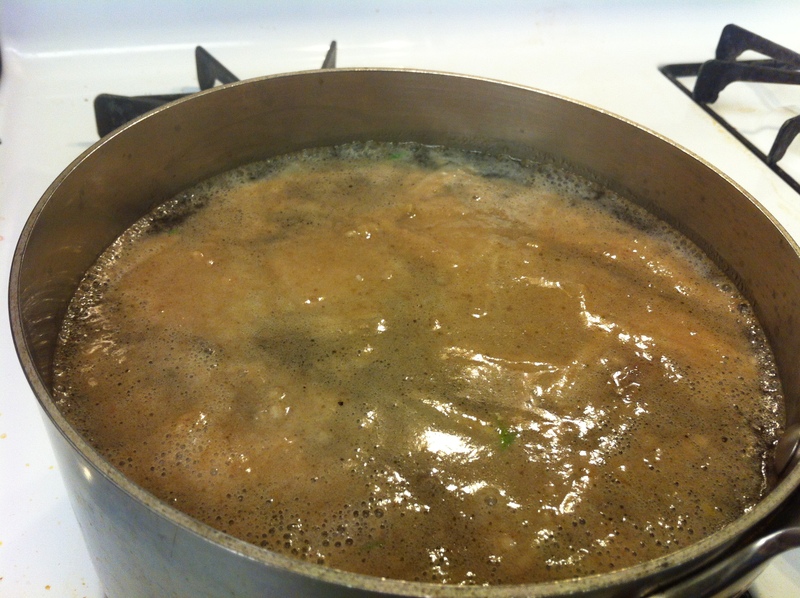 There was a perfectly fine clear broth underneath the ugly foam was. 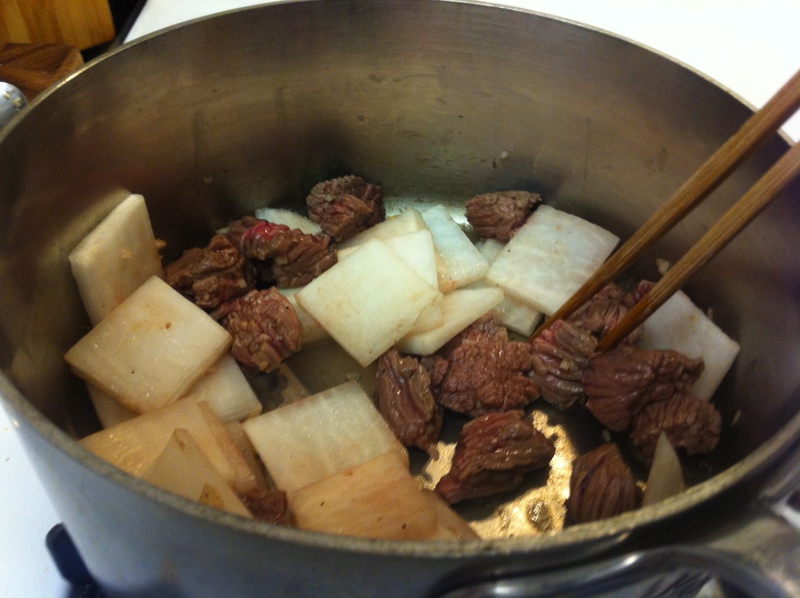 Season with gukganjang and if you have fish sauce, you can add a tablespoon of it as well. Add a tablespoon of minced garlic and chopped scallions. Cook for another 4-5 minutes. Freshly cracked black pepper at the end is a great touch. Serve with a bowl of rice. This entry was posted in Good for breakfast, Good for dinner, Good for lunch, Meat/Chicken, Soup/Stew (국/탕/찌게) and tagged Beef, Moo by gangnamkitchen. Bookmark the permalink.